Workbook BOGOF – Expires 5pm TODAY! If you’re on this page it’s because you’ve seen the BOGOF offer on my printed workbooks. 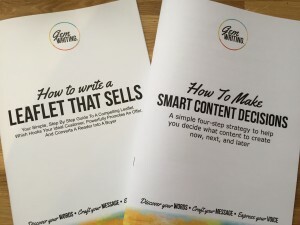 It’s really simple to take advantage of this great deal… if you buy a copy of How To Write A Leaflet That Sells before 5pm today I’ll also send you a FREE copy of my new workbook – How To Make Smart Content Decisions (worth £35). If you’re interested in crafting better copy and using the written word to help you build relationships with your perfect customers, then these resources will be super useful. And because they’re printed (not some naff digital thingy!) they can sit on your desk, ready for you to dip in as and when you need an idea or inspiration. These workbooks usually retail at £35 each, but if you buy before 5pm today, you can have them both – and POSTAGE IS FREE! Simply click the pay pay button below, and I’ll rush your workbooks by first class post.